Winnipeg Jets | Who's Going to Backup Connor Hellebuyck? Jets’ Burning Question: Who’s Going to Backup Hellebuyck? 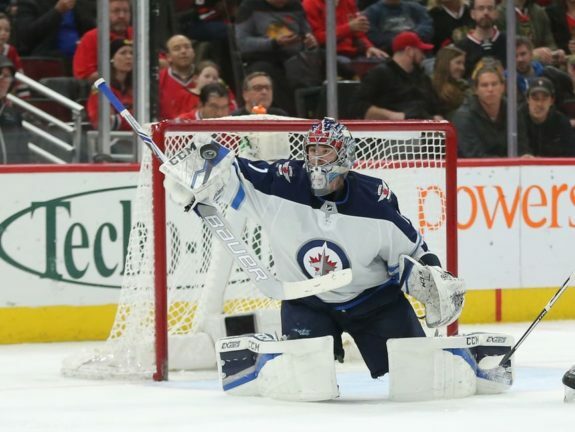 The big news in the Winnipeg Jets’ crease this offseason was the extension signed by Connor Hellebuyck, yet the more important decision has yet to be made. That decision? Who will backup Hellebuyck? The 2018 offseason left the Jets’ goaltending depth depleted. First, there was the buyout of Steve Mason’s contract – following an injury-filled season when his tandem with Hellebuyck collapsed – and then there was the departure of Michael Hutchinson to the Florida Panthers, where he is likely to play a third-string role behind the tandem of Roberto Luongo and James Reimer. To plug this hole in the Jets’ depth chart, general manager Kevin Cheveldayoff looked to the open market, signing Laurent Brossoit to a one-year, $650,000 contract. Welcome to Winnipeg, LB! #NHLJets agree to terms with goaltender Laurent Brossoit to a one-year contract with an AAV of $650,000. Once seen as a blue-chip goaltending prospect for the Calgary Flames, an organization that desperately needed stability between the pipes, Brossoit was dealt to their provincial rivals where he was likewise pegged as the potential long-term backup to Cam Talbot. His tenure with the Edmonton Oilers did not last, as Brossoit toiled in the minors for five years, being used sparingly by the big club. Ultimately the Oilers chose to let Brossoit walk, signing KHL goaltender Mikko Koskinen to back up Talbot, yet the Finn also has many question marks. Now it appears that Cheveldayoff and the Jets are hoping that the third time’s the charm. The numbers, however, do not inspire much confidence. In his 28-game NHL career – albeit behind some very bad Oilers teams – Brossoit has a goals-against average of 2.97 and a save percentage of .897, to go with a 7-13-2 record. While Brossoit was playing in the minors, his numbers were not much better, as he played more than 30 games in a season only twice in the AHL. 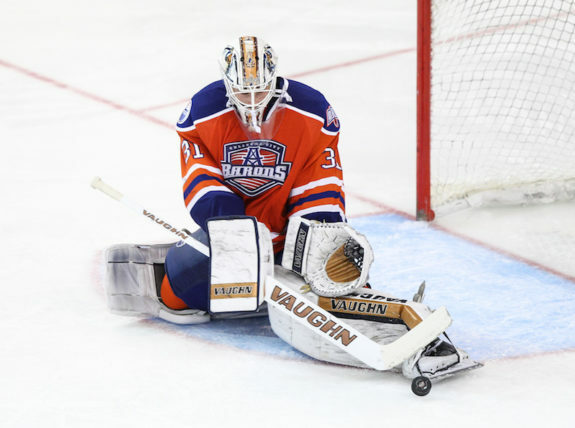 In his five-season tenure with the Oklahoma City Barons/Bakersfield Condors, the B.C. native had a 2.58 GAA and a .909 SV%. Perhaps Cheveldayoff is hoping to catch lightning in a bottle like he did with Hutchinson, but with solid options like Cam Ward available during the 2018 offseason (who ultimately chose to sign with the Chicago Blackhawks), the choice to sign Brossoit was an eyebrow-raiser. Heading into the 2018-19 offseason, the Jets will be deciding which young prospects will bear fruit. Josh Morrissey, Kyle Connor, and Jack Roslovic have successfully made the jump to the NHL, Chase de Leo was shipped to the Anaheim Ducks, Sami Niku seems poised to fight for a spot, and JC Lipon recently re-upped for another kick at the can. The one looming question, outside of Jacob Trouba’s future with the organization, is what to do with 23-year-old Eric Comrie. Like Brossoit, Comrie’s AHL numbers don’t inspire much confidence. In his short professional career, the Edmonton-born goaltender has a 52-67-16 record, a 2.95 GAA, and a .908 SV%. Keeping in mind that his early AHL career was spent with an underwhelming Moose squad – as well as playing second-fiddle to Hellebuyck – Comrie put up a respectable 18-13-3 record, 2.58 GAA, and .916 save percentage in his second full season as an AHL starter, despite having Hutchinson around to steal the spotlight. However, with Hutchinson and his insane numbers gone, the Moose’s crease is there for Comrie to play full-time for just the second time in his career. Yet this does not mean Jets fans should expect him to be in the minors all season. It’s equally likely that Brossoit could fill that position while Comrie gets a taste of NHL action. The main issue that will dog Comrie for the rest of his career is his size. Listed at just six-feet-tall and 175 pounds, he is much smaller than the average NHL netminder. This lack of size has made his time in the AHL difficult, as he has been unable to see past screens by much larger opponents and needs to be more mobile to keep up with quicker skaters and more accurate shooters. Yet, Comrie has the tools to make up for his lack of size. He’s a smart and speedy goaltender, that uses his athleticism to stay in plays and make highlight-reel saves on many occasions. If he can improve his positioning and hand placement to cut down on his movement – the opposite problem of his counterpart in Hellebuyck who was victimized by his large frame in his first season as a starter – Comrie could flip the script and prove he belongs in the NHL. While he is unlikely to usurp Hellbuyck as the Jets’ starter, there is still time for Comrie to prove he can hold down an NHL job ahead of a possible trade or time on the free agent market.